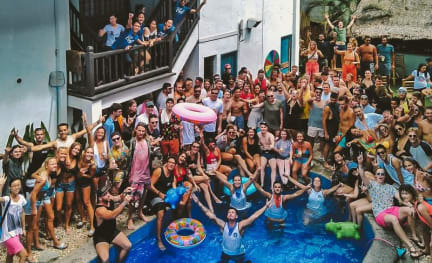 Mad Monkey Hostel Boracay is a resort-style party hostel equipped with a massive pool, bustling bar, and DJs every night of the week! We also have an in-house spa retreat and comfortable rooms. 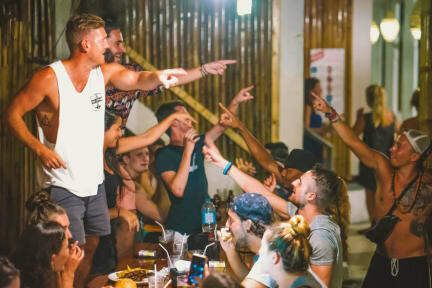 If you have come to Boracay looking for a good time, look no further than Mad Monkey Hostel Boracay. Our rooms are top notch. We have dorm rooms with pod-style bunks and oversized beds with ensuite bathrooms, air-conditioning, and large lockers. Each bed comes with a personal light, fan, and sockets for your convenience. We are but a three-minute walk to Bulabog Beach and a seven-minute walk to White Beach’s main strip. IMPORTANT: We are a party hostel. This means music plays until a bit after midnight and there will be party animals in and around the hostel at most hours. If this isn't your thing, we recommend you to stay elsewhere. If you've come to meet people from all around the world and get involved in the Philippines' best party atmosphere, this is the spot to stay! We tend to book out all year round, but especially in the peak months. Book in early to save your spot! Outsiders are more than welcome to join us at the bar and on our boat party, as well. I only came for the snorkelling. Quality hostel, staff and reps were great, beds are huge and rooms have air con. Tonnes of free drinks and good party everyday. Strongly recommend the boat party. 100% the best place I've stayed! I was here 6 nights, missed a flight to stay an extra night. The atmosphere is amazing the reps Sam, Mel and Robbie are doing a great job! Theres a different event every day, make sure you plan your stay to be there on a Tue/ Sat so you can get on one of the boat parties! 11am you will hear the bell ring for free shots at the bar. HUGOOOOO! Without a doubt one of the best hostels I’ve stayed in. Great staff, great atmosphere, good food and rooms / bathrooms were kept clean. Sam & Sam did an amazing job of getting everyone involved everyday/night! If you don’t like drinking and want a quiet trip though I wouldn’t recommend.... definitely for the social people! Had one of the best hostel stays of my life at this place. Honestly the people are amazing, the local staff are great and the two reps Sam and Sam are exceptional. Definitely do the boat party! Thanks guy!! Great stay here! Both sam’s the staff at mad monkey got the atmosphere going and made our trip great will defo be back back to visit. Location isn’t the best as you’ve got to walk through basically a building site to get to it from white beach but it is just 5 mins from white beach. Great atmosphere in the evenings as people from other hostels come here, however it was quiet during the day here. Drinks at the bar are expensive. Probably not worth what you actually pay but one of the best hostels I’ve stayed in the Philippines. Beds are comfy and more like small doubles. Great hostel to meet people! We arrived and actually all fell ill, so didn’t really get to mingle and get to know others. It is definitely not a hostel to go to if you want sleep! the parties didn’t stop until 1pm at the latest. It’s the craziest mad monkey I have ever stayed in! If party party 24/7 is what you want then book here.